* As this event is expected to be fully-subscribed can you please e-mail Sean Hamil – at s.hamil@bbk.ac.uk – in advance to confirm your place. Brian Oliver – Sports Editor of The Observer. Filippo Ricci – Author, journalist and authority on African football. Stefano Tirelli – Personal trainer to leading African players. John Utaka – Nigerian international and player for Premier League club Portsmouth. 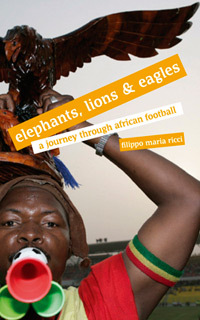 To mark the publication in the UK of Filippo Ricci’s acclaimed review of African football Elephants, lions & eagles: A journey through African football (2008) (the book was first published in Italy in 2006) the Birkbeck Sports Business Centre is hosting a round-table discussion on the future of African football after the 2010 FIFA World Cup. African football has made enormous progress over the last fifteen years. African players are present in large numbers in all the top European leagues and are widely respected for their contributions to team success. The African Nations Cup is now a major global football tournament with growing media interest outside of Africa from a global football audience. Club football in some African countries, notably South Africa, is becoming increasingly popular amongst supporters and amongst international media and corporate sponsors. And finally the staging of the FIFA World Cup in South Africa in 2010 offers an opportunity for African football to make a step change in how it is perceived on the global football stage, a coming of age as a true global partner in world football. On the other hand, below the top level of hugely successful African players in Europe there are huge numbers of migrant players who are cruelly exploited by the European football industry; protecting the player welfare of this group is a major challenge. Many commentators observe that whilst African football has made progress, the twin spectre of organised corruption and managerial incompetence continues to inhibit the growth of the football industry on the continent, despite the significant investment of FIFA and the CAF (the African football union) in the African game. Around all these issues swirls the central drivers of African football’s success, the extraordinary passion for the game on the continent, and the incredible playing talent it generates. In the discussion the panellists will each give their own unique insight on where the African game is headed. And then take questions from the audience. Critically the debate will address the critical question; can African football carve out an independent position as a powerful global partner in world football in its own right, or is it destined to remain largely a provider of highly talented playing talent to the top European teams? Ricci, Filippo Maria (2008). Elephants, lions & eagles: a journey through African football. London: When Saturday Comes (WSC) Books. Brian is one of Britain’s best known and influential sports journalists. Currently in his eleventh year as sports editor of The Observer, the world’s oldest Sunday newspaper, he helped to launch Observer Sport Monthly magazine, the most widely read sports magazine in Britain. Previously he worked at the Daily Telegraph for 15 years. He has been a supporter of African football (and music) since seeing World Cup qualifiers in Egypt and Zimbabwe in the late 1980s, and is an expert on the progress of players from Africa. Filippo is a native of Reggio Emilia but grew up in Rome. After graduating with a degree in Contemporary History he began working as a journalist exclusively covering African football. His passion for his subject saw him travelling extensively around Africa attending no less than seven African Nations Cup tournaments. From 2000 to 2006 he lived in London working with Italian newspapers Corriere della Sera and Gazzetta dello Sport. Since 2006 he has been working in Madrid. He is the author of Elephants, lions & eagles: A journey through African football (2008) an acclaimed, insightful and affectionate review of his experiences following African football in which he examines the careers of many of the great African players who have become household names in European football. Stefano has built a reputation as one of the most successful and influential personal trainers in modern world football. In 1989 he graduated with a degree from the Italian University for Physical Education writing a dissertation entitled ‘Analysis of African football’s conditions and prospects’. After a second degree in Sport Sciences he becomes a teacher in Complementary Sport Techniques at the Università Cattolica in Milan, publishing a number of successful books on the subject. Since 1989 he has travelled in more than 80 countries around the world working with the national football teams of Ghana, Emirates and Qatar and as personal trainer with top flight players such as Michael Essien, Sulley Muntari, Nwankwo Kanu, Stephen Appiah and Alessandro Del Piero. John Utaka is a Nigerian internationalist. Following successful spells at Arab Contractors and Ismaily of Egypt, Al-Sadd of Qatar, and Racing Lens and Rennes in France, he signed for English Premier League side Portsmouth in July 2007 for a fee reputed to be around £7,000,000. A pacy winger, on 17 May 2008 Portsmouth won the FA Cup with a 1-0 victory over Cardiff City with John Utaka providing the cross for the winning goal which was scored by Nwankwo Kanu.